One of the bigger things to happen while I was away last week was the announcement that Rob Thomas and Kristen Bell were putting the Veronica Mars movie, long sought after by both, on Kickstarter. The biggest thing to happen while I was away last week was that they met their 2 million goal inside ten hours. As of this writing, the fund has gathered $3.7 million, with more then twenty days left in the campaign. This has since been heralded at the most hyperbolic as an important turning point in the history of cinema, at at the least flamboyant, the introduction of independent film making 2.0. I'm glad I was away when it happened, because by the time I got back everyone else had analysed what had happened half to death. It afforded me the chance to read the opinions, read the facts, and put together a fairly rounded opinion of what we'll get moving forward. Now, nearly two weeks later, I've collected my thoughts on whether this is a good thing, a bad thing, and whether anyone else should give it a try. This isn't a new idea. It's just the first time anyone has tried it. Kevin Smith initially wanted to fund Red State through donations, but never followed through based on legal advise. Back then, Kickstarter didn't exist. What Rob Thomas and Kristen Bell did was show in a way a major studio understands (ie. money) that there is fan interest in the project. And it worked. The studio might have responded more tepidly to it if, after thirty days, it only barely reached the goal. But to reach it within a day sent a very clear message to Warner Bros, who have officially greenlit the project. And while the original deal called for Warner Bros to cover additional costs plus merchandising and distribution, the fund has over performed so well that fans will entirely finance the picture themselves. This is exciting, to be sure. It has created an entirely new form of film funding. Instead of driving around to dentists, looking for investors, now filmmakers can appeal directly to the intended viewers, who are willing to pay to make the film, as well to see it. And are more then willing to see passion projects come to light. But should they? I was a fan of Veronica Mars from minute one. 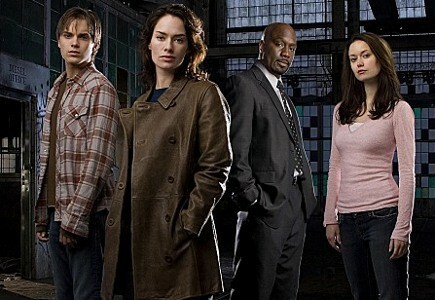 I watched all three seasons, and was increasingly disappointed with each, as the demands of the network took control of the structure of the show, and an overwhelming desire to recapture that uniqueness of the first season caused the episode by episode quality to decrease. I'll see a Veronica Mars movie, but I don't know if it is necessary. The commonly stated reason is taht the show needs a proper conclusion, but does it really? I don't think so. I think it had one. Was it a happy ending? No, furthest from? Was it a unambiguous ending? Absolutely not, plot threads were left flapping in the breeze. But does it need those things? No. Some will disagree, but I say an ambiguous ending is just as valid as a concrete one. Is it less satisfying? I say not. I liked the way Veronica Mars ended. Did Keith win or loose the election? Will he be arrested for tampering with evidence? What happens to their relationship, the staple of the show, now that Veronica is to blame for all that? By not knowing, we can bring our own feelings to the "conclusion," rather then just being told. I like not having every answer spoon fed to me. And remember, Thomas knew that there was a decent chance the show would be cancelled (in fact, if I remember, knew the show wouldn't be returning before the last three episodes were produced), and structured the finale as-is in case of that eventuality. They made their own bed. Unlike other shows, which were cut off a couple episodes in (Drive) or after a season (Alcatraz) or cancelled unexpectedly after years (Farscape, which did get a wrap-up miniseries), Thomas put the pieces together in those final episodes of season three as best he could, and in a way I felt worked. I might be alone in that belief. I actually lied earlier. This has been done once before. In 2003, FOX cancelled a TV show, prematurely according to the fans. So those fans went out and bought copies of the DVD. In huge numbers. So many, combined with huge fan turnouts at events featuring the cast, that it convinced Universal that there was enough interest to warrant a film, released in 2005. At this point, you should obviously know what show, and what film, and what creator I'm talking about. 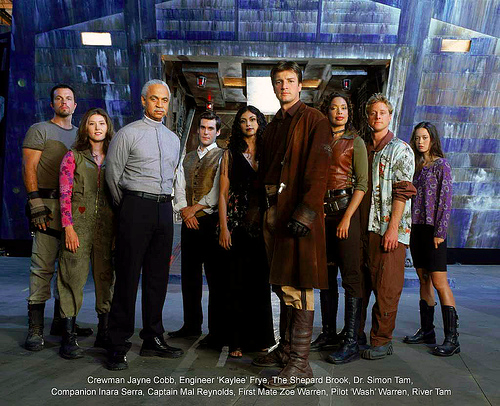 Firefly, and the eventual Serenity, was a landmark moment. Before Whedon and co., failure on TV was failure. Shows died, and went away. Serenity came back. Everything serious thought that Thomas and Bell have had about bringing the show back, they owe to Serenity. Thing was, Serenity did it the same way, with methods available at the time. Fans pledged money, in the form of buying the DVDs. This convinced Universal to take the chance on the film. Mars is doing the same thing, but with a more direct approach. "I don't even entertain the notion of entertaining the notion of doing this, and won't. Couple years from now, when Nathan's no longer Castle and I'm no longer the Tom Hagen of the Marvel Universe and making a giant movie, we might look and see where the market is then. But right now, it's a complete non-Kickstarter for me". I'm fine with this. Most of the cast are busy with other things in their career right now, and that Firefly/Serenity is nicely contained and doesn't really need to be expanded further. It'd be nice, but just because you can do a thing doesn't mean you should. I like things the way they are. I feel that if Whedon were to assemble them again, it might be nice to see these talented actors in new roles, in a new story, in a new universe. Zachary Levi has, since the series ended, been investigating a possible Chuck film, miniseries, or web series. On twitter, he has made clear his interest in using this Kickstarter method. My question is: why? The show had five seasons on NBC, four of which it dug and clawed from the network through sheer force of will. And it was three seasons longer then it should have been, with the quality of the show dropping off steeply with each returning seasons (like a resurrected monster, it kept coming back wrong). It went so off the rails, it lost me completely in its final year, and still had the time and opportunity to end however they wanted. They, unlike most other shows on this list, got a full life and choice of conclusion, and they still want a wrap up movie? Sounds more like greed, or a case of the shoulda' coulda' woulda's. Live with what you did, and move on. Show creator Josh Friedman responded to fan questions via Twitter, confirming that there is no chance of seeing the Sarah Conner Chronicles revived in any way. The reason? Rights issues. The rights to the Terminator franchise, both on film and on TV, are all over the place. The film right, recently sold off, are held up by the intended production of a fifth (and third unnecessary) film in the proper series. Add to that the lack of general public memory of a short two season run of a TV series which runs counter to the standard franchise timeline, and it screams confused viewership. What might seem the logical next attempt, considering that it too is from Rob Thomas, but he and the cast, as they have been for some time, are convinced that they can get funding for a Party Down film through conventional means (it helps that as cheap as a Veronica Mars film will be, Party Down would be even cheaper). If regular funding sources fall through, and the Mars attempt is a success, Kickstarter does remain a viable option. In the days immediately following the success of the Mars fundraising, Thomas revealed he had received an email from perpetually-being-cancelled creator Bryan Fuller, saying “Hey, can you jump on the phone with me at some point? I know you’re busy, but I would love to talk to you about how this thing works.” Fuller has made no secret about wanting to conclude Pushing Daisies elsewhere, having very nearly done it as a comic book in the wake of the success of Buffy Season 8. However, Fuller has since said that Pushing Daisies, what with the unique design and digital elements, would cost around $10 million to make, three times as much as Mars has currently raised. He also has already seen the possible downside of this sort of thing, in the abysmal direct-to-market conclusion to Dead Like Me. Happily, however, Fuller, who is currently in Toronto working on his new Hannibal series for NBC and thus doesn't have the time right now to do any of this, has also expressed interest in reviving my personal favourite of his effort, Wonderfalls. Aside from the fact that most of the cast is working elsewhere right now, the biggest obstacle I can see in this is the cost. 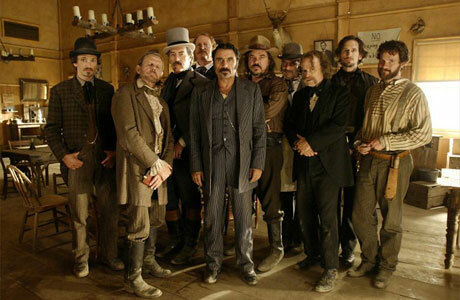 A Deadwood film, something the producers wanted to do immediately after the series was cancelled, would be very expensive to make. And as much as I'd like to see Al and Raylan... I mean, Seth, back for one last story (most likely based on how the real life Al eventually had his bar burned to the ground, and was left penniless in the world), David Milch seems to have given up on this a long time ago. The way things are going this season, Community needs to fund a Kickstarter to go back in time and allow the series to end with the departure of Dan Harmon. Without the creator's influence, the show has lost it's soul, becoming just another tepid, less intelligent version of itself. Unless Harmon returned (he wouldn't), a Community movie wouldn't be worth doing. Better to leave dead horses alone. Now, this is a beast of a different colour. 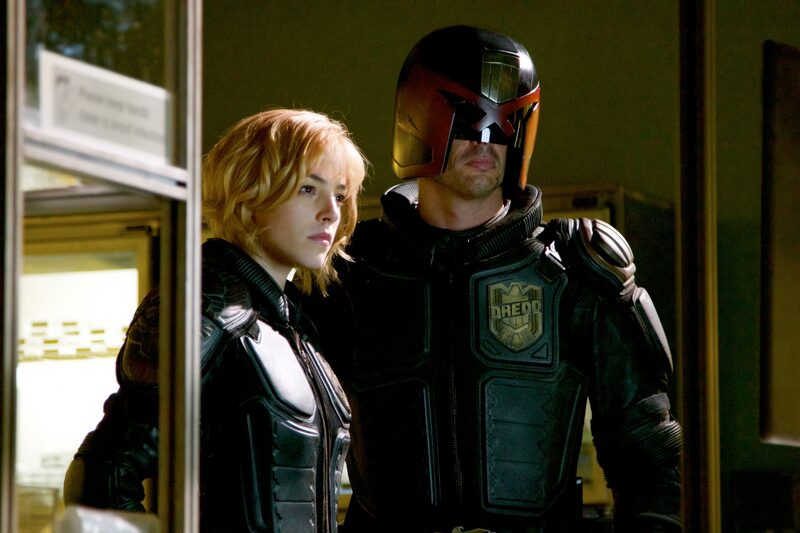 Dredd isn't a failed TV show, its a film that didn't meet it's immediate financial targets. It's failure at the box office is largely attributed to poor marketing and lack of available screens at the time of release. It did receive a major word of mouth boost, and the DVD and on demand sales reflect that. Kickstarter has been a suggested possibility for funding a Dredd sequel since the beginning. This has already been a slight trend, with the David Fincher adaptation of Eric Powell's Goon having already used Kickstarter to get the process started in adapting the comic to film. What is important is that right now, this is nothing but a number on a website. Once the money is in hand, and the film is in production, it'll be a honest-to-gods thing. What all these other creators and producers, and everyone else online needs to remember is that until the movie is on the screen, this isn't a success. It is an attempt, and no one should start moving forward on another attempt until it has been proven a viable option. If the film meets the intended 2014 release, then we can start having serious conversations about what else can give it a try. And then discuss our inevitable disappointment about which shows they've chosen to try to bring back.